Disclosure: I got this product as part of an advertorial. All opinions stated are genuine and my own. If you have kids, you likely also have a fairly large selection of children's DVDs. I'm not sure how they multiply like they do, but one day there are none in the house, and the next thing you know there are more than you can remember without looking! Some are good, some are so-so, and some are favorites of you but not your child (or vice versa!). When you find one that both you and the kids agree on, and it's educational too, that's worth a virtual high five. IRIS the Happy Professor gets the High-5! This is Iris. He is happy to teach pre-schoolers (and beyond) about Science. For this DVD series, Fraggle Rock puppets were brought in (one of my husband's favorite shows), and lessons about Science are taught via a fun loving puppet professor with an oversized bow tie. We received Volume 3 (there are three volumes) which covered such topics as fruits & vegetables, the Earth and sky, and minerals. 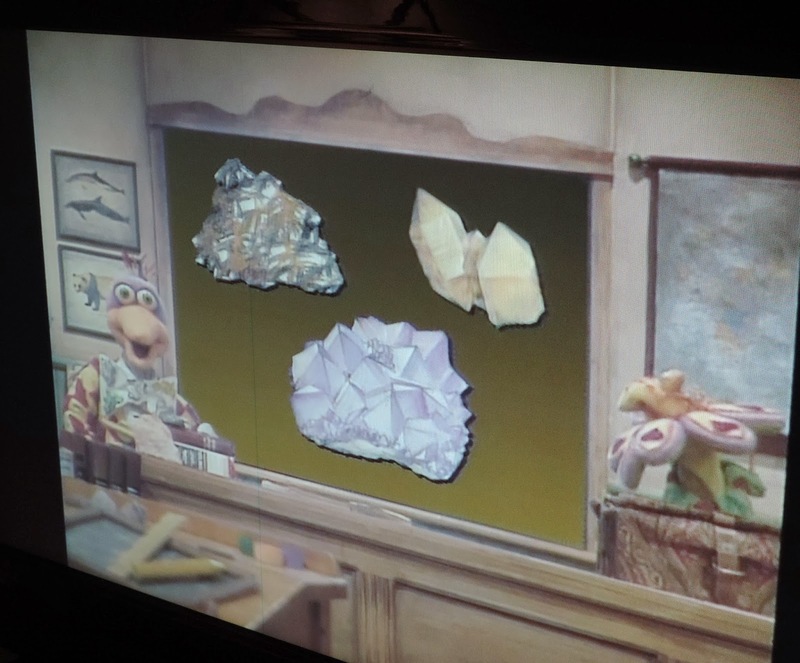 Though this show is intended for pre-schoolers, my 6-yr. old loved it and learned quite a bit as well, especially about Minerals! He already knew some of the lessons taught, but he did not know chalk was a mineral, and he was delighted to learn it (he has an easel with a chalk board on one side, so the information was relevant). Grandma and Grandpa came over for dinner tonight, and he shared some of his vital new information with them while we were eating. It's fun to watch him get so excited about learning. It's especially fun to see him getting excited about Science. There's a stigma sometimes attached to the subject as being either boring or difficult. I don't think it has to be either! Science offers a lot of fun, relevant information, and it lends itself very nicely to hands-on application, which almost all kids love (it's fun to experiment). 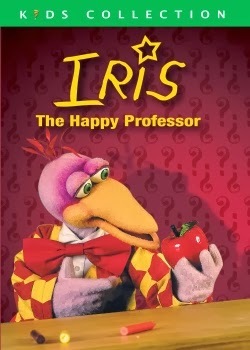 I thought IRIS the Happy Professor was an excellent DVD, and my son did too. It's also a movie you can watch time and again and keep learning something new each time that you put it on. The run time is 87 minutes, but it's broken down into smaller segments for each lesson (perfect for those with either a long attention span, or those who prefer a movie dose in much smaller time chunks). You can learn more about IRIS the Happy Professor by visiting Organa. You can also follow them on Facebook, Twitter, and/or subscribe to their YouTube channel. One lucky winner gets an IRIS the Happy Professor DVD of their own! US entrants only. Great to hear about another educational tool to help kids learn to love science. It's such an important subject. My kids would love this and I'd love them to learn about science through this. Cute characters. My daughter would love it. This looks a little bit like Sesame Street characters. I know my son could really enjoy this! Thank you for this review. There's not too many educational DVD about Science and I'm happy to find a great one here. It is good to know that it is not a boring one too! I loved Fraggle Rock when I was a kid! That is very cute.. he looks like a muppet? I love the whole idea behind this DVD. Children learn faster when they are having fun, and this DVD set make that happen easily. I will be looking into them for my grandkids! this looks cute and very entertaining for little ones! What a cute show. I like the bright colors and interesting features of the bird to keep kids attention. I loved Fraggle Rock as a child. I love this. My daughter loves to learn & she is a fan of videos. I wouldn't mind her watching something educational such as this. That looks like a cute DVD my kids would be interested in! I love educational shows for my kids, especially ones that make them think long enough to share their new information with others. That's awesome. I loved educational movies that are entertaining for the kids. This looks like a great one. I should check this out. My little one is really into science. That's really fun! We actually don't have a lot of kids DVDs yet. He's only 21 months, so I'm trying to limit how much TV he watches. I've actually never seen Fraggle Rock, but educational is always good. What a great program. I love cartoons or shows that teach. Kids love learning and it should be fun! I think my son would love this!! I entered! Very cute giveaway! I must make my niece watch this. If Fraggle Rock is involved, I'm in!! Actual Fraggle Rock puppets? That is awesome. This looks great. My kids love having DVDs and I love when they are educational! I could get into this - nevermind my son. This is something I would have loved growing up. Baby Audi would like this. I don't suppose I ever thought about it, but I don't think even I knew that chalk is a mineral. Sounds like a wonderful, fun DVD my little daughter and niece would really enjoy. Sounds like a cute movie -- think the kids would really enjoy it. Hahaha, Fraggle Rock was one of my all time favorite shows too! I haven't heard of this dvd yet, but I bet it's a good one! Fraggle Rock was an all time favorite for my kids. Now this? I am checking him out! The DVD looks really educational, and it's very hard to find things for kids in this day and age that are appropriate...in my opinion. This is so cool! It reminds me of my fraggle rock days!! I love letting my kids watch videos that are entertaining and educational!! This really looks like something my kids would enjoy! & I would too knowing how educational it is. I've never seen any of their DVDs. They look like fun! Thank you for a great giveaway, I'd like to win this DVD For my kids! what an interesting way to teach Science! love the idea! This looks like so much fun! I loved stuff like this when I was growing up! Thanks for sharing! Awe. My kids, even the big ones, would love this. Fraggle Rock was one of the best shows! I think it sounds great but we don't have a DVD player. I love educational products that are not fluff... This one looks like and excellent teaching tool. Love Professor Iris too. Never heard of this before, but it looks really cute and like something that my daughter would enjoy. Oh, this is really cute! I have two pre-schoolers in my household, and they would really enjoy this. That is so true about the DVDs and multiplying and agreeing. But I get most form the library and then we have to return them, so not too much of a problem here. I'm loving this idea of this DVD though. Looks very educational. this sounds so cute! Bet my nephews would love this! This is adorable! I remember Fraggle Rock. I'd love to win it for my niece. This would be so cute for my Grandson. Maybe make a nice Valentine gift. This looks like a fun and educational show for kids. I'd like to win this for my niece. Thanks. I wasn't familiar with this prior to reading your review! It looks fun and I think my niece would love it! This DVD would be nice to watch with my grandson. I love when you can make learning fun! Especially when they don't even realize they are learning! Looks like fun- my boys would enjoy watching this. our family would enjoy this dvd. thanks for the chance to win! i am tony l smoaks on rafflecopter.